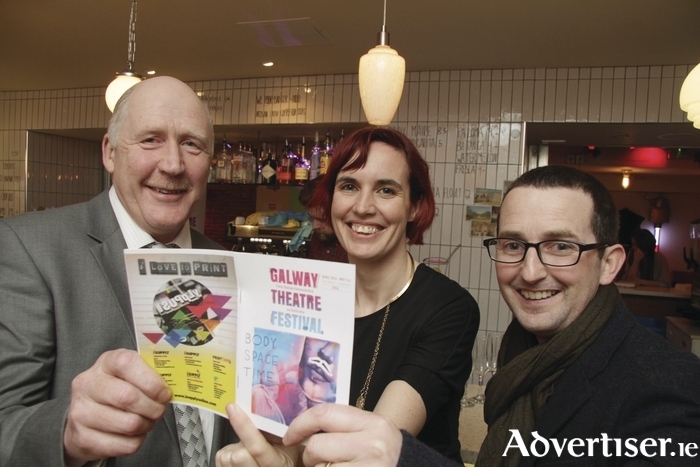 THE LAUNCH for this year’s Galway Theatre Festival took place on Monday at a lively gathering in BiteClub in Upper Abbeygate Street. A large and enthusiastic crowd gathered to mark the occasion, and between sips of prosecco and tasty canapés, the assembled guests pored over their programmes and amiably chatted about the many attractions on offer. The festival runs from April 29 to May 7 across a range of city-wide venues and presents an array of exciting theatre work, much of it new. Among the attractions is Brokentalkers’ award-winning The Blue Boy, which deals with the experience of children in Catholic residential insititutions; Little John Nee and Laura Sheeran premiere their new collaboration, Ribbons; Sarah Hoover’s ‘durational performance’; Expectations is inspired by Charles Dickens’s Miss Havisham; and WillFredd, one of Ireland’s leading young companies, presents Care, which gives an insight into the world of hospice staff. Looking through the programme it is notable how many of the productions cross stylistic boundaries or are in themselves structurally fluid. In Mmm Theatre’s My Poet Dark and Slender, based on a story by Padraic Ó Conaire, ‘movement and text become fragmented, music warps out of tune and lights cast shadow but reveals little’. John Rogers’ P.I.S.C.E.S., a science-fiction show about alien contact, happens simultaneously onstage and online, its content varying from night to night depending on audience interaction and social media. Guerilla Aerial draw on dance, acrobatics, music and improv in Alice M, the company's exploration of 19th century playwright and activist, Alice Milligan. There is certainly no shortage of imagination and innovation on offer in this year’s festivals, facts which were readily acknowledged by Branar Theatre’s artistic director, Marc MacLochlainn who was the guest speaker at the launch. “There are interactive pieces, visual arts, circus, and there is even some theatre there as well!” he observed, raising a warm laugh from the crowd. “That’s the beauty of Galway Theatre Festival; it stretches what the word theatre could be, what the experience of going to and being part of a live event is and that’s what we need. You can go to see an ordinary show but there also has to be somewhere where experimentation can happen.